Justin Timberlake shows us his spiritual side (dailymail.co.uk). I never understood people’s obsession with Justin Timberlake. Sure, he’s a good dancer, and some of his songs are catchy, but what’s so impressive? Last week, he changed my mind, though. 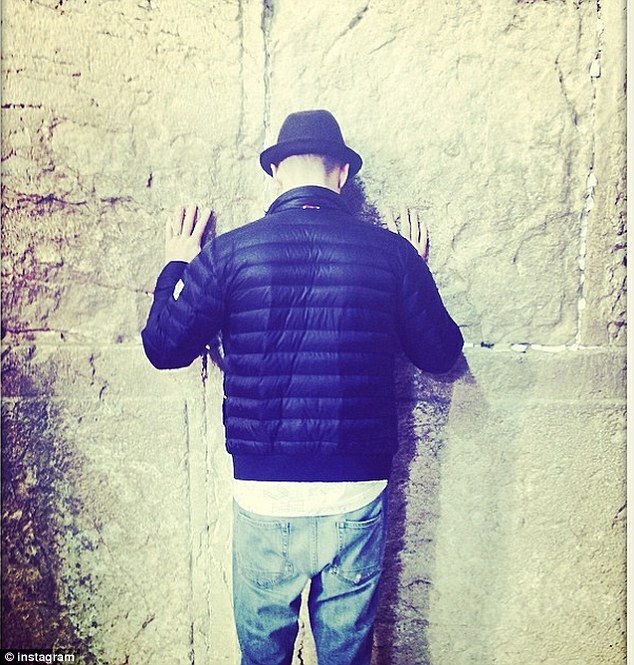 I was smitten by Timberlake’s Instagram photo of his praying at the Kotel, or Western Wall, in Jerusalem. Clearly I’m not the only one who feels this way, as the picture already has over 260,000 hearts on Instagram. To accompany the photo, JT tweeted “The Holy Land… What an experience. I will never forget this day. #Israel”. If you haven’t been following the news, it’s that hashtag that’s stirred controversy among Timberlake’s fans, some of whom believe “#Palestine” should have been the hashtag. Timberlake was in Israel to perform in Tel Aviv, Israel’s large, cosmopolitan city. Coincidentally, his concert was scheduled for Jerusalem Day, the Israeli holiday that celebrates Jerusalem’s reunification following 1967’s Six Day War. Before performing, he traveled to Jerusalem with his wife, actress Jessica Biel, and his parents shortly after their flight landed at 3am. Given the timing, this was clearly not some publicity stunt; it was a trip of personal meaning. And who can blame JT? Anyone who has ever visited Jerusalem can attest to its incredible sense of history and magical spirituality. The city pulses with a sense of being part of something powerful, something larger and more meaningful than any one of us alone. That is all the more true at the Kotel, Judaism’s holiest site. Clearly the visit moved Timberlake, who may or may not be personally religious, but most certainly is not Jewish. The photo is heartwarming not least because it captures a celebrity looking humbled and awed in the presence of the Divine. So much of current popular culture denies the existence of anything transcendent, let alone timeless, in our world. This is a subtle reminder that we humans are neither omniscient nor omnipotent. The believers among us pray because we must. Prayer matters, because we often need guidance and because we can’t do momentous things, like bring peace to Israel and its neighbors, alone. As for laying the groundwork for a more peaceful world, Timberlake also deserves credit for simply performing in Israel. While music should ideally be a unifying, apolitical force for good, the Boycott, Divestment and Sanctions movement has politicized performing in Israel and scared away performers including Stevie Wonder, Elvis Costello, and Annie Lennox. That’s a shame, not least because as even the biblical kings knew, good music can be healing. Timberlake’s reaction to the public uproar has been noteworthy. In addition to performing what major Israeli newspaper Haaretz described as “two hours of pure pleasure” for 46,000 fans in Tel Aviv, Timberlake has stood fast. He has not deleted his Instagram photo or the related Tweet, nor has he apologized for his Israel-friendly sentiments. Unlike Gwyneth Paltrow, Timberlake is not whining about the public attacks. He’s sticking by his words and deeds, and by the Middle East’s lone liberal democracy. JT has earned my respect. ← Chirlane McCray: Bad Mom?